Toronto is losing Criminal Records. Sarnia is gaining Red Vinyl Records and Turntables. 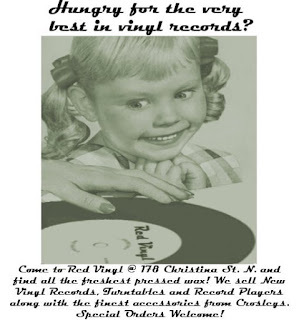 The project of fellow CBC Radio 3 blogger RedVinyl, the small independently owned record shop will be selling new- and hard-to-find vinyl (some used), turntables, players and record player accessories, as well as accepting special orders. The grand opening is Fri., Aug. 5, and features an in-store performance plus a concert at the Trinity Lounge. Need proof vinyl is really back in a big way? We were coming back from the Al Tuck show at Phog Lounge in Windsor on Tuesday, and declared the CD we'd bought. The border guard looked at us and said: "You didn't buy vinyl?"